Blog April Fool's Day - what's the difference between a joke and a lie? April Fool’s Day – what’s the difference between a joke and a lie? On this day, we discuss the difference between a joke and a like. Secondly, what makes something funny? Finally, what makes something in poor taste, offensive, or even abusive? In my family, we love to joke around and I told my kids that if something untrue is thrown out there and not qualified withing 40 seconds, the joke becomes a lie if it isn’t immediately clear that it was a joke. So what makes something funny? If it is opposite, unexpected, or exaggerated, then it can be funny. An important aspect of understanding what is funny versus in poor taste, offensive, or abusive is subjective and fuzzy, which is why artificial intelligence always has a difficult time with it. You see, the thing that makes something funny is dependent both upon the user (i.e. the tone, body language, and sequence/context in which it’s been delivered) but also the intended audience. The assumptions of what is okay to say and what is offensive depend on a lot of subjective, ego-laden assumptions. Jokes that are at someone’s expense, in contrast to absurdities of logic and language, are notoriously difficult to navigate because of the problems surrounding, gender, race, sexual orientation, politics… etc. Satire is a often a form of ridiculing of authority, which is usually portrayed as inferior in its morality. Interestingly, there is so much nonsense, lies, satire, sarcasm, facetiousness, overt propaganda, and bullcrap on the internet, it seems that people’s appetite for April Fool’s Day is lessened. The need to be skeptical of everything you read on the internet has spread to the other 364 days and I suppose that is a good thing. Because people are starting to awake to the notion that everything must be questioned, it is harder to be funny but it is also harder to fool people. So what is the difference between a joke and a lie? Of course, it depends on reality and facts. So what are facts? Objective qualities of real events that we can agree upon. And what can we agree upon? Not much. So really, everything can be seen as a sort of joke. One day, people will snicker at the ridiculousness of Quantum Mechanics but for now, it doesn’t make for much comedy. One day, people will look at some religious beliefs and mock them without getting killed. 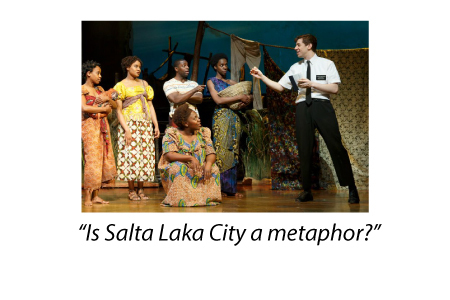 I just saw The Book of Mormon and they took the subject of religion and tried to show how arbitrary and manipulative religion can be. 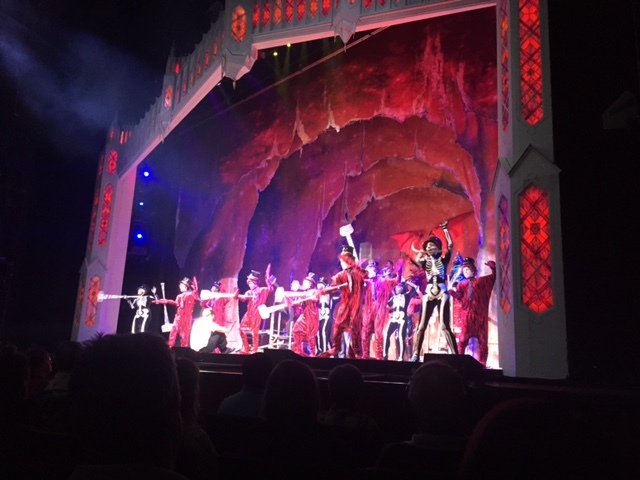 In the number shown here, they sang about all having the, “spooky Mormon hell dream” that kept them from doing forbidden things like drinking coffee or questioning the word. Of course, it is easy to mock a more recent religion and treat its tenents as “a joke” to the point that the anti-hero’s made up verses about fornicating with frogs to cure AIDS made it into the final “Book of Arnold”. One man’s meat is another man’s “Charlie Hebdo”, I suppose. Very observant! When we saw it here in New York, a Muslim friend suggested that if the same treatment took on the Koran, i.e. A satirical Musical drafted up by non Muslims (Turns out no Mormons were creators of BOM) that the theater would be bombed by now. This would go beyond a lie dogma or joke. Blaspheme should be added to the list. Though I laughed out loud, I also have Mormon friends from Ivy League school who objected most to the suggestion that the un-enlightened fall for religion or that it is some comicon-fanboy-for-Jesus fantasy. Your post was very fair minded.